About: Hilo Medical Center (Hilo, HI) is the largest employer in the Big Island of Hawaii. Located in a medically underserved area, where physician shortages hover around 35 percent, HMC’s surrounding community also exhibits some of the highest rates of chronic disease in Hawaii. Challenge: HMC has been evolving its approach to sepsis over the years. In determining areas for quality improvement, the hospital found that 85 percent of sepsis cases were present on arrival at the emergency department. While MEDITECH’s ED Tracker provided clinical information from the patient’s EHR, staff needed a way to more quickly identify and treat septic patients. Execution: Recognizing the need to better assess patients, hospital leaders looked to MEDITECH’s Sepsis Management Toolkit and Quality and Surveillance solution. Using the toolkit’s evidence-based and outcomes-focused implementation guide, staff aligned best practice workflows within the EHR. By refining such interventions, HMC continued to adapt its clinician workflow in the ED, making significant strides in quality improvement. 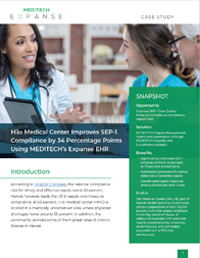 Results: Within months of implementing MEDITECH’s Quality and Surveillance solution and guidance from MEDTECH’s Sepsis Management Toolkit, HMC surpassed Hawaii’s 68 percent core measure compliance by reaching 76 percent compliance for coded data. Coordinated sepsis response among physicians and nurses.